Since you expressed it well, I understand your nostalgia. It’s like one of those naked on a rug baby pictures. You can contemplate its existence with affection, but you don’t want it hanging on the living room wall. As I expect you’re aware, the nostalgia associated with this particular flag is a historically inaccurate fantasy. It’s a battle flag, not the one used for CSA government. And no one cared enough to run it up a public flagpole until the damn Yankee gubmint decreed that integrating schools was mandatory. There was no need for “remembrance” between 1865 and 1956. Yes, I am aware of that flag’s history. I’m also conscious of the genteel weirdness in my own history and hope it helps make a point. Thanks for commenting. Keep the symbols. You only want to get rid of them because of today’s political correctness. That is a disease that can be cured. Future generations will not be plagued by it, if at some point, rationality again enters the human experience. If by “political correctness” we mean “speaking and acting as if all human beings are equally human” then I sincerely hope all future generations are far more plagued by it than we are. Too often the only people using that term are people who want to be able to openly and without accountability demean and degrade other people on account of their skin color/gender/sexuality/mental capacity/nationality/weight/etc. Martha–you make many interesting points, and articulate well (which does NOT surprise me) the dilemma we experience with objects that were intended to show the superiority, the “rightness” or some such, of the makers of the objects or even monuments or buildings. Your focus is on individually owned items, but many of the complexities apply too to public items. I think it is important to keep certain things–e.g. some of the Nazis’ death camps. For example Auschwitz is falling apart, and that has sparked a firestorm of controversy: let it crumble? or keep it? On that issue, I can argue both sides–the evil that it represents is so horrific, so objectionable, so never-to-be-repeated that the destruction of that death camp would be fitting. And yet…yet, I realize that we humans are plagued with such short term memory that keeping something tangible to remind us–not to celebrate–but remind us that this is the evil of which we are all capable, in our darkest times. Remove the physical structure and perhaps remove the memory. So, your family mementos–probably these don’t rise to “for the sake of history” keeping. But they still serve a purpose. So, I think there’s a difference between keeping something, such as you describe, and intentionally collecting the same. Only a museum or some other institution of learning should collect such. But as for the Confederate battle flag…yes, absolutely, take it down. OK you may not like what I have to say, but the Confederate flag to me is a sign of treason pure and simple-to say nothing of racism and evil. We are Americans. Take that thing down. Why would I not like it? I said the same thing. 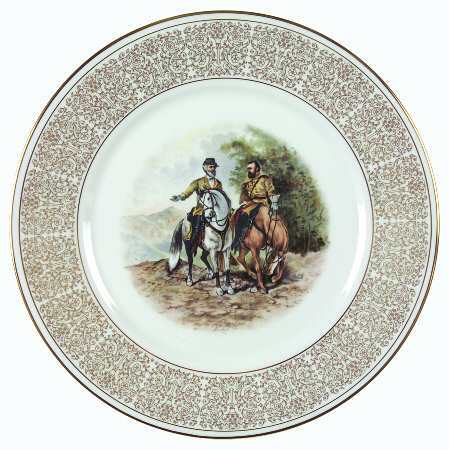 Keep the plate as it is a family heirloom. I was able to feel the warm feelings it brings about your dad. I think I would even have it on display. As to the flag I feel it should never be flown on public grounds. It is a symbol of treason and should never be flown near the American flag. I do not know if your ancestors fought in the Civil War or on which side if they did. My advice is not to judge them for their actions which we will never understand fully. My ancestors as far I know were all in the Union army. However if I go back to the Revolutionary War they were on both sides of that issue. I feel that your Father’s enlighten views came from the knowledge he had of the Civil War and his understanding of human nature. Now that I think about it I would hang that plate with a picture of your Father right next to it. It’s really not a family heirloom. It’s a 1970s era decorative plate, part of a set from Franklin Mint. It certainly illustrates the tension between remembering family and national history as opposed to glorifying it.